Jeff Fitzgerald swaps stories with George Dunster at an open house for Dunster at Lima’s Encore Theatre. LIMA — You can take George Dunster out of Lima, but you can’t take Lima out of George Dunster. The long-time media and theatre icon is moving in with his daughter in Delaware, Ohio. Due to a hip replacement, the 86-year-old is more comfortable sitting down in a wheelchair than directing plays. Many of the people whose lives he touched came to Encore Theatre Sunday to wish him well and to swap stories. When Dunster arrived in Lima in 1960, he probably never imagined what kind of an impact he would have. As the long-time news director at what is now WLIO television, he mentored hundreds of reporters, including a very young Jeff Fitzgerald, current news director at Your Hometown Stations. “George hired me in 1985. He brought me in with really no experience. He was my mentor, gave me a chance. I remember him looking over my shoulder many times wondering if I could type, so I was working on a typewriter and he says, ‘You need to figure out how to type and type fast, young man, or you’re not going to make it.’ Without George, I don’t have the career I have. I’m very appreciative and that’s what I wanted to tell him,” said Fitzgerald. In March 1963, Dunster was working for The Lima News. He spent 13 years in that job, followed by a couple of years at WIMA radio. In 1973, he started working in television, something he did for 25 years, retiring in 1999. He spent his retirement years working at Veterans Memorial Civic Center. It was in 1963 when Dunster started his relationship with the theatre scene in Lima, acting in and directing numerous plays at Encore Theatre throughout the years. Joe Warnement, who recently directed “Steel Magnolias” at Encore Theatre, cited Dunster as a big influence on him. “I met him when I was 18 years old. My very first experience with him was ‘My Fair Lady’ down at the Civic Center for Town Square Music Company where he played Henry Higgins and I was just one of the town kids in the chorus. Bigger than life, George was. Then I got the opportunity to work with him at Encore in ‘A Chorus Line’ a couple of summers later, and we ended up doing a lot of things together. Most recently, he directed me in ‘Driving Miss Daisy’ and ‘Cabaret.’ I just studied everything he did, listened and watched, and he mentored me on a couple of my high school shows that I directed. He’s just been a really big help in making my directing and acting career more of a success,” said Warnement. So what is Dunster going to miss most? “The theatre here. I’m a lifetime member and lifetime trustee, so I miss being in the board meetings and I miss directing,” said Dunster. He was a bit overwhelmed by all of the attention. “I think it’s wonderful. I am a little embarrassed by it all. There’s a lot of good people here,” Dunster added. 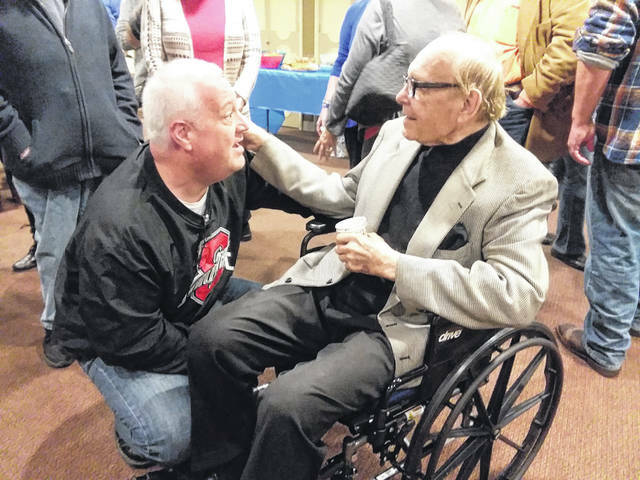 https://www.limaohio.com/wp-content/uploads/sites/54/2018/10/web1_DunsterFarewell-toned-1.jpgJeff Fitzgerald swaps stories with George Dunster at an open house for Dunster at Lima’s Encore Theatre.